The most common signs of mold are quite obvious – most notably, discolorations on basement cinder blocks or external brick walls or even embedded in the sheetrock of your Monroe, Michigan area home’s living spaces. 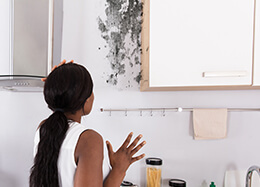 Secondly, a strong musty odor is also indicative of a mold growth problem and usually one that is located in a place where it cannot be readily seen. Finally, a noticeable increase in allergy and asthma problems in the inhabitants of the home – for no other discernible reason – can indicate the presence of a mold infestation. Where Would You Find Mold in the House? There are thousands of species of mold but all are fungi. This fact means that they thrive in areas where they find sufficient moisture, organic manner, and heat for growth. As they do not rely on photosynthesis to produce food, they can live in places where green plants cannot. While many molds are merely aesthetically displeasing, there are various species that are several pathogenic ones that are quite harmful to humans. A strong distinction should be made between the two and the latter should be dealt with as quickly and firmly as possible. The first step in mold remediation involves the removal of the largest colonies – that is, the ones that are most visually evident. The second step involves identifying why the mold is growing where it is. Usually, this means eliminating the source of water that allows the mold to grow. Without this moisture, the mold simply will not reproduce. The area should then be scrubbed with bleach and, finally, the removed material – whether it is wallboard, flooring, or ceiling material – must be replaced. Molds are also tenacious in remaining in a home because they reproduce by producing large numbers of very small spores. These spores are then disseminated by air currents in the home. This fact means that they can easily spread throughout an entire home in a fairly rapid manner if the problem is overlooked or ignored and is not treated as soon as possible. Air quality professionals use a host of technologies to determine the level of mold in a home even if it cannot be seen. Even better, they will not only identify a mold problem, but they will also identify where the problem exists and how the homeowner can fix it. For more detailed information on mold and the best way to safely remove it from your Monroe, MI home or to speak with a qualified mold professional, please contact us at the Mold & Air Quality Professionals. We can be found online at MoldAQP.com or reached directly at 734.755.3457.